The sinking of the Lusitania is back in the news in the UK as newly released secret Whitehall files show that the Ministry of Defence warned that "something startling" was going to be found during the August 1982 salvage operation. In 1915, Britain was fighting Germany in the First World War. Millions of men were dying. In September 1914, only a year before, when the war started, British soldiers were sure they were going to be home with their families for Christmas. Now, it was sure that the soldiers were going nowhere. They were dying in the fields of France and Belgium. However, the United States of America was not fighting. For most Americans, this was a European war, far away from home. They could not see why their young men must travel thousands of kilometres across the Atlantic Ocean to die in somebody else’s war. What’s more, many Americans had families and friends in Germany. Not all Americans were friendly towards Britain. On 7th May, 1915, many Americans changed their minds. The ‘Lusitania’, a ship with more than a thousand people – not soldiers, but men, women and children from America and many different countries – sank near Ireland. A Germansubmarine shot a torpedo into it. 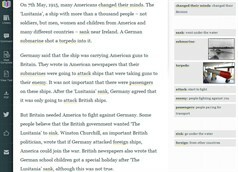 Germany said that the ship was carrying American guns to Britain. They wrote in American newspapers that theirsubmarines were going to attack ships that were taking guns to their enemy. It was not important that there were passengerson these ships. After the ‘Lusitania’ sank, Germany agreed that it was only going to attack British ships. But Britain needed America to fight against Germany. Some people believe that the British government wanted ‘The Lusitania’ to sink. Winston Churchill, an important British politician, wrote that if Germany attacked foreign ships, America could join the war. British newspapers also wrote that German school children got a special holiday after ‘The Lusitania’ sank, although this was not true. However, most importantly, many questions about the British government and ‘The Lusitania’ do not have answers today, acentury after the ship sank. Many documents about the sinking are still secret. Other papers do not have important pages in them – they are lost. So, we can only ask questions and decide what we think. The British government knew that there was a German submarine near ‘The Lusitania’ but they did not tell the ship to sail away. They also told the ship to go more slowly. Why did they ask that when they knew there was a Germansubmarine near it? Why did the government not send warships to sail with ‘The Lusitania’? There were many ships near Ireland but they did not travel with the passenger ship to help and protect it. And how could one torpedo sink a large ship so quickly? In 1990, an Irish television programme said that near ‘The Lusitania’ at the bottom of the sea, there were hundreds of bombs. Did the British sink the ship because they wanted America to fight against the Germans in the First World War? Perhaps we will never know. But, in 1917, Germany again said it was going to attack passenger ships with guns on them. America then joined the First World War. Britain was very happy. The next year, the war was finished and Germany lost.